Cracks in your paved surface not only diminish your property’s visual appeal—they’re the first signs that your asphalt is deteriorating. Once unsightly cracks begin to emerge, time is of the essence. If left unsealed, water and moisture will eventually reach the sub-base of your asphalt. This causes the cracks to intensify, ultimately leading to “alligatoring,” potholes, and sunken areas in your pavement. 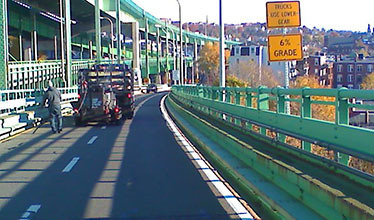 The entire process is accelerated even further by the freeze-and-thaw cycle of New England winters. Why Choose Asphalt Crack Sealing? When used in conjunction with a sound asphalt maintenance plan, crack sealing can slow the progression of cracks, help maintain a safe surface, and extend the longevity of your pavement. What does this mean for your business? You can avoid the hassle and expense of major repairs or asphalt replacement for many more years. Superior Sealcoat carefully assesses your paved surface to determine which asphalt repair solutions will provide the greatest benefit at the lowest cost. 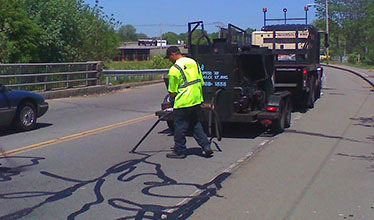 Superior Sealcoat has provided crack sealing services for government agencies, municipalities and organizations across Massachusetts and New England. 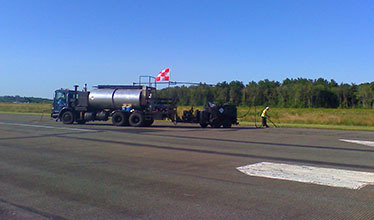 Crack sealing airports to highways and roadways to parking lots utilizing hot rubberized sealants and hot asphaltic cements. Our company uses the highest-quality sealant products available today as well as cutting-edge equipment to ensure a flawless and watertight finish. The type of asphalt repair should depend on a variety of factors, including the extent of surface cracks and whether there is failure within the sub-grade level of the pavement. Our experts carefully evaluate your paved surface to determine which type of asphalt repair approach will provide the greatest benefit at the lowest cost. ch type of asphalt repair approach will provide the greatest benefit at the lowest cost. Have you noticed more cracks in your commercial asphalt surface? Contact Superior Sealcoat today 978-988-5555 to receive a asphalt crack sealing estimate or click to request an estimate online.